Khris Davis is a masher. He crushed pitching as a minor leaguer, and has boomed 33 home runs in 200 career games. Now, I was leading the ‘I believe in Khris Davis‘ movement even before he surprised everyone during Spring Training in 2013, and I even had the opportunity to interview him last year. But despite my clear bias towards the man, Davis has a fault that pitchers took advantage of in 2014; he can’t hit the changeup. The Milwaukee Brewers, as a team, weren’t thrown many changeups in 2014 but, according to Baseball Savant, Davis saw 225 of them alone, leading the club. The fastest changeup was 90 mph and the slowest was 74.2 mph. As the season wore on, pitchers began to figure out that the changeup was his Achilles’ heel, and they also discovered that they needed to pitch him down on the corners and out of the zone (see picture below). They absolutely dominated Davis with low changeups and stayed away from leaving them up in the zone. With the aggressive nature of Davis, pitchers knew their changeup didn’t need to be a strike for him to take a whack at it, and he ended up whiffing at 25.3% of them. 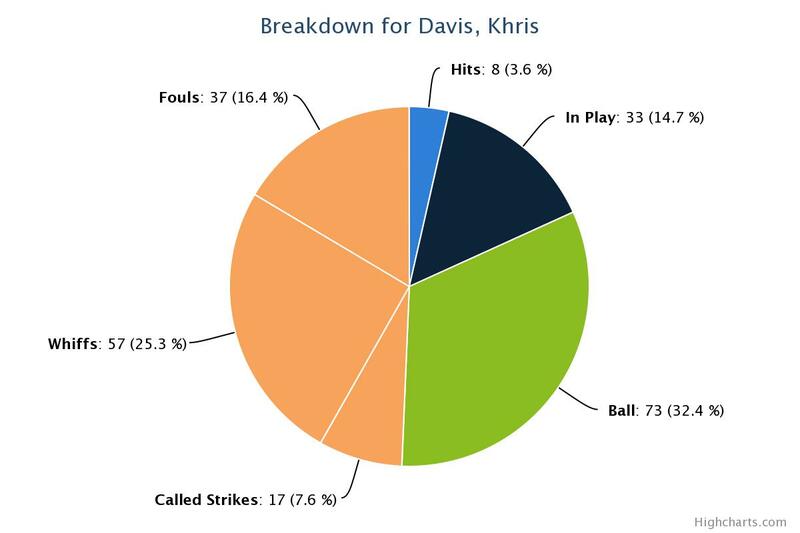 Here’s a breakdown of what Davis did when we was thrown a change. Spoiler: It’s not pretty. He swung and missed more often than he put the ball in play, and managed only eight hits for a .131 average. Just five players had worse batting averages versus the change (minimum 50 ABs): Jason Kipnis (.098), Adam Dunn (.100), Brandon Moss (.101), Alex Avila (.115), and Brian Dozier (.122). After all of this, I probably don’t need to tell you that Davis was worth -5 runs against the changeup, the 10th-worst mark in baseball among qualified hitters. However, with that being said, he was worth positive runs versus every other pitch, with the exception of the split-fingered fastball. 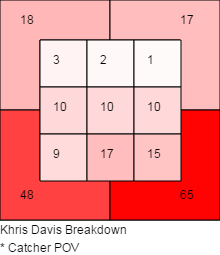 The changeup seems to be the only pitch with which Davis has a real problem. Sure, he batted just .217 against the four-seam fastball, but he knocked 10 of them out of the park and garnered a .276 isolated power. 2015 will be a big year for Davis. He’s entering his age-27 season, and will most likely have to compete with Gerardo Parra for playing time. If he can’t be at least average with the changeup and if he continues going fishing out of the zone, pitchers will have a field day with him. This entry was posted in Player Profile and tagged Khris Davis, Milwaukee Brewers on November 29, 2014 by Justin Schultz. The Most Valuable Player award was given out last night to deserving candidates Mike Trout and Clayton Kershaw. There is really no argument that they weren’t the correct choices. But, when I began looking at how each writer voted, I was startled when I came across the ballot for Milwaukee Journal Sentinel’s own Brewers beat writer, Tom Haudricourt. Haudricourt is no slouch with the pen. He was named Wisconsin Sports Writer of the Year in 2011 and 2012, and is obviously extremely knowledgeable about the Milwaukee Brewers. With that being said, however, I’m calling his 2014 MVP ballot into question. I really have no problem with anyone on the list or how they were ordered. I mean, Matt Holliday would have been six miles away from my ballot, but I’m not going to argue about it. However, how Haudricourt gave Adrian Gonzalez a fourth-place vote is beyond me. How he voted for him ahead of Jonathan Lucroy is even more utterly ridiculous. Gonzalez finished seventh overall in the MVP race, but Haudricourt gave him the highest nod. Here’s how many other votes Gonzalez received. You can find the complete National League ballot here. Haudricourt clearly overvalued Gonzalez, as 14 of the 30 writers didn’t even cast a vote for him. In Haudricourt’s explanation of his picks, he fails to even mention Lucroy or Gonzalez, so we really have no idea what he was thinking or where he was coming from. It left a lot to be desired. So, I’ll attempt to break it down a bit and to try to figure out what inspired Haudricourt to vote the way he did. Gonzalez led MLB in runs batted in and was among the top 20 in home runs this past season. Those were probably the two leading factors that went into Haudricourt’s decision. And that’s where he went wrong. RBIs are relatively useless and don’t tell us much about the skill set of a player. For example, Ryan Howard racked up 95 RBI last season, and yet, finished with a negative WAR. The silly thing is, Haudricourt didn’t even need to use a sabermetric stat to come to the realization that Gonzalez wasn’t worthy of an MVP vote. Gonzalez’s on-base percentage of .335 just barely placed him in the top 70. Does that sound MVP-worthy to you? But it’s not that Haudricourt voted for Gonzalez that grinds my gears, it’s the fact that he thought Gonzalez had a better season than Lucroy. There is honestly no argument that can be made defending that. Lucroy received one second-place vote (from FanGraphs’ Dave Cameron), 13 fourth-place votes and six fifth-place votes, among a few others. Only two ludicrous writers left him off their ballots. What I’m trying to say is, almost every writer valued Lucroy over Gonzalez, except Haudricourt. Now, I understand Haudricourt isn’t sabermetric-savvy, so he probably doesn’t care about pitch framing. And that’s too bad, because that’s where a lot of Lucroy’s value comes from. According to StatCorner, he saved 22 runs by expanding the strike zone for his pitcher. But let’s look solely at hitting. Based on this table, try to figure out who had the better season. Lucroy wins hands down. To even further Lucroy’s cause, he and Gonzalez had almost an identical amount of plate appearances. Did I mention that Lucroy is a catcher? Not much more needs to be said on the matter. It’s a shame Lucroy was robbed by Haudricourt. He deserved better from his beat writer, fair and simple. This entry was posted in MVP and tagged Adrian Gonzalez, Jonathan Lucroy, Milwaukee Brewers on November 14, 2014 by Justin Schultz. Was the Brewers bench as bad as it seemed? Throughout the entire 2014 season, I was critical of the Milwaukee Brewers bench. Not the actual bench the players sit on, but the players who are classified as bench warmers. Aside from Rickie Weeks and Lyle Overbay, both part-time starters, I felt the team had no real hitters behind the regulars. This was before I ever looked at the statistics. This was merely based on the eye test. But a few days ago I decided to take a closer look and to see if my eye was on point. The Brewers accumulated 47 pinch hits last season, which was the seventh-most in baseball. The Pittsburgh Pirates led with 61. But while they were among the top 10 in pinch hits, their .222 average was around the middle of the pack. Still, they were five points over the league average of .217. Here’s a breakdown of who those 47 pinch-hits came from. There were seven players with one. Take away Weeks and Overbay, and the Brewers hit .180 (22-for-122) when pinch hitting. Without them, there was really no one who an opposing pitcher had to worry about. Khris Davis was 0-for-11 as a pinch hitter, and his outfield partner, Gerardo Parra, was 1-for-8. . Those are extremely small sample sizes, but with pinch hitters, that’s what you have to expect. Based on this, my eye test passed. Now, instead of judging the Brewers pinch-hitting capabilities on their batting average, let’s look at their wOBA and OBP in order to get a more accurate picture of how they fared. Note: I’m only using the players I listed above. Weeks, Overbay and Reynolds were clearly the best bats off the bench for the Brewers. Bianchi could have been one, but an injury derailed his season. Meanwhile, Gennett really struggled off the pine, Schafer was useless and Herrera added absolutely no value. They just didn’t get the job done. Going back to my eye test, the Brewers performed better than I originally thought. Their on-base percentage and wOBA, which says a heck of a lot more than batting average, was admirable. It probably could have been even better if Roenicke utilized his bench in a more reasonable way. Some of the decisions he made were head-scratchers, but you can say that about any manager. The scary thing is, the best pinch hitters that Milwaukee had in 2014 will be gone next season, and the worst will most likely remain on the roster unless Doug Melvin is able to scrounge up better hitters. Having Parra on the team for an entire season will definitely help, but if Herrera and Schafer return to the bench, the Brewers might as well have the pitchers hit for themselves. This entry was posted in Pinch Hitting and tagged Lyle Overbay, Mark Reynolds, Milwaukee Brewers, Rickie Weeks on November 11, 2014 by Justin Schultz. Jonathan Lucroy will get some MVP votes and he should have won a Gold Glove in 2014, but this is apparently Yadier Molina‘s world and we all suffer live in it. That is Major League Baseball’s official slogan, is it not? Nevertheless, I don’t really want to get into a ring and duke it out with a Cardinals fan, so I’m going to stop my sarcastic tone right now…at least during this post. What I’m trying to say is Lucroy is a heck of a ballplayer. He’s improved in almost every season, and part of that has been because he’s been able to stay healthy. Since his wife dropped a suitcase on his hand in 2012, he’s played in 300 out of 324 possible regular season games over the last two years. That’s crazy for a position player, but for a catcher, that’s certifiably insane. But let’s get back to his improvement, particularly when it comes to strikeouts and walks. Each season, Lucroy has drawn more walks than the last, and has reduced his strikeouts since 2011. He’s doesn’t swing at pitches outside of the strike zone nearly as often and has even taken more strikes in the zone. Lucroy saw 2,551 pitches last season. Of the 146 hitters who qualified, only 27 saw more and none of them were catchers. However, that’s a bit of an unfair assessment because no catcher came even close to the number of plate appearances Lucroy racked up. So, because Lucroy’s being more selective at the plate, his on-base percentage has skyrocketed and he ended up with top 20 finish in the OBP race in 2014 (is that even a thing?). The 28-year-old catcher has also stopped swinging and missing. Just like his BB%, his whiff rate has fallen each year in the bigs. With that being said, though, when Lucroy does strike out, he does so on a pitch he misses on. He struck out 71 times last season and 46 of those were on swinging strikes. But that just means his eye at the plate is fantastic. There’s so much more I can say about the man, but that’s for another time. And I’m sure if Lucroy continues to decrease his strikeout rate and increase his walks, I’ll be right back here next year writing about the same thing. I’ll try and think of a better title, though. This entry was posted in Short and Sweet and tagged Jonathan Lucroy, Milwaukee Brewers on November 10, 2014 by Justin Schultz. Is Aramis Ramirez’s power gone? Aramis Ramirez, who will turn 37 in June, will make $14 million in 2015. 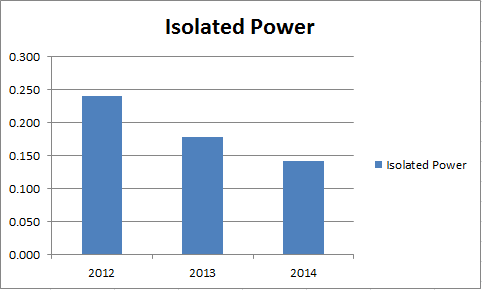 Aramis Ramirez, whose isolated power has dropped each of the last three years, will make $14 million in 2015. Aramis Ramirez, who has missed a combined 99 games since 2012, will make $14 million in 2015. Think about those statements before you continue reading. Now, this isn’t a post about how the Milwaukee Brewers are overpaying Ramirez. I already sang that song about Yovani Gallardo, and I don’t like repeating myself (just ask my girlfriend). I just wanted you, the reader, to know that Ramirez is making that much money at that age even though his power has disappeared. Instead of the usual table I present to get my point across, here’s a bar graph. Clearly, his ability to hit for extra base hits is dissipating with age. But what about his home runs? Here comes another table. Even though Ramirez played 41 more games in 2014 than 2013, he only managed to hit three additional dingers. A reason for Ramirez’s lack of power in 2014 was his uncharacteristic poor patience at the plate. He whiffed at his highest rate since 2003 and swung at 39.5% of pitches outside of the strike zone (his career O-Swing% is 29.7%). By swinging at non-strikes, Ramirez put himself in a hole and therefore, struggled to produce. He only manufactured nine percent more runs (109 wRC+) than league average; not exactly what you expect from a cleanup hitter. So, what can we expect from him next year? Steamer projection system is anticipating Ramirez will hit 17 home runs and have an ISO of .164 in 122 games. But I must say, if he’s only going to be playing in 122 games, there’s no way he’s going to hit north of 15 homers. I’ll be running out my own projections when spring training comes around, but I’ll take a swing at Ramirez’s now. If he’s able to play 130+ games (which is doubtful at his age), I think he’ll hit 15 home runs and post a .330 wOBA, 110 wRC+ and .155 ISO. His days of hitting 20+ home runs are over, especially if he keeps chasing pitches. This may be Ramirez’s last year as a professional baseball player and is surely his last year in Milwaukee. Here’s to hoping he exceeds expectations, but don’t put any money on it. This entry was posted in Power Play and tagged Aramis Ramirez, Milwaukee Brewers on November 6, 2014 by Justin Schultz.